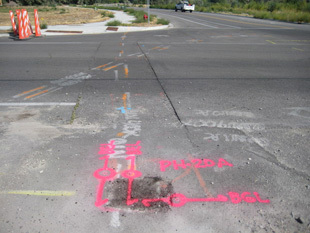 SUE Solutions successfully completed the Quality Level ‘A’ locating services (potholing) for the Provo Northwest Connector Road project located in Provo, Utah, for H.W. Lochner, Inc. and Provo City. SUE Solutions contracted with H.W. Lochner to perform the utility investigation tasks on this project. This planned transportation project is to include roadway reconstruction and realignment. As the project design was approaching completion, H.W. Lochner identified locations where potential project design conflicts exist with existing underground utilities. These conflict points were the focus of the SUE investigations. SUE Solution’s Scope of Work included Quality Level ‘A’ locating (potholing) services, as well as the coordination of the survey and CAD activities associated to the potholing efforts. The QL-A locating services were completed in November of 2012. SUE Solutions was able to complete the project’s SUE activities, a total of thirty-one (31) test holes, ahead of schedule and under budget. Utility coordination efforts were also conducted with existing utility owners and local utility locating contractors in order to ensure the success of the SUE activities. The final deliverable to H.W. 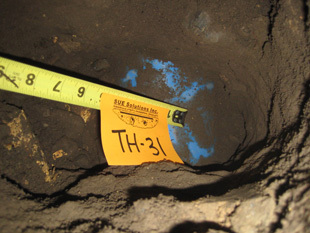 Lochner and Provo City consisted of a comprehensive final SUE report which contained Quality Level A Test Hole Data Sheets, Sewer Data and Information Sheets, and Quality Level A test hole photographs.